The LIS AGM will be held on the evening of Wednesday 25th April at Adam House basement theatre, 3 Chambers Street, Edinburgh. The full programme of the event can be viewed here. 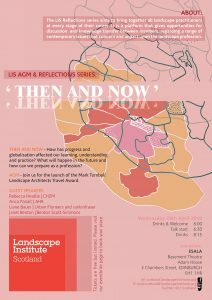 The difference between graduating as a landscape architect in the late 20th century and in the early 21st century is only 30-40 years however the changes that have occurred in in that timeframe have been enormous. We will hear from four practitioners, each at a different stage in their career, some with experience of working or learning abroad, and reflecting on the changes and challenges that they have experienced in their working life since graduating. The draft minutes of the 2017 AGM and the financial report 2017-2018 can be viewed here. Would you like to be part of one of the most active branches in the UK? There are opportunities for involvement and to enhance the profession in Scotland. 2017 – 2018 has seen an incredible momentum in the work of the branch from events, exhibitions, competitions as well as influencing work with agencies and government. All these activities contribute towards the LI CPD requirements. The LIS is required to make 4 honorary elected appointments of a Chair, Secretary, Treasurer and Branch Representative. There is an opportunity to shadow the honorary officer roles for a year. In addition, a further 8 committee members can be nominated and any number of committee support or corresponding members. We invite you to view the description of the work of the LIS and these roles. Please contact us with your nominations for Honorary Officer posts with your name, contact details and supporter by Monday 16th April 2018 at the email address below to ensure time for a ballot in the event there is more than one applicant. If you wish to attend the AGM, you will need to book a ticket through EventBrite. Tickets are free of charge but places are limited. More details are available on our website. If you have any queries, please contact the LIS mail.scotland@landscapeinstitute.org.